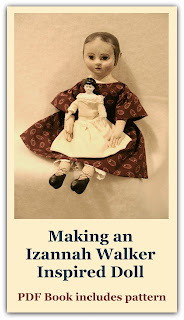 Coffee with Tea, a dollmaking group I'm in, has fantasized about ways of discovering an original Izannah Walker doll. My husband is watching the kids and has said, "Take the day off. Have fun! And here's $100 ($500, $1,000? $1,000,000...) for you to have fun with. I won the fantasy baseball pool. Oh, and by the way, while you're out Vern Yip (or Martha Stewart, or Carter Oosterhouse) is coming over to redo the living room (studio, bedroom, whole house...)." I did mention this is a dream, right? Anyway. I run out and hop in Old Bessie, our Grand Caravan with 93,000 miles on it. Ah, you gotta love Old Bessie, she's not much to look at, but she's taken me on many an adventure. I take the road out of town off to the country to breathe some Mud Season air. It's one of those beautiful crisp days in spring when everything is coming alive. You can't quite see it yet, but you can sense it. I decide to stop in at a country store that has the best whoopie pies. I select the most round Whoopie Pie and pick up a Diet Coke to go along with it. A girl's gotta set limits, y'know ;-) I set my items on the counter to pay and see a sign attached with masking tape to the customer side of the cash register. 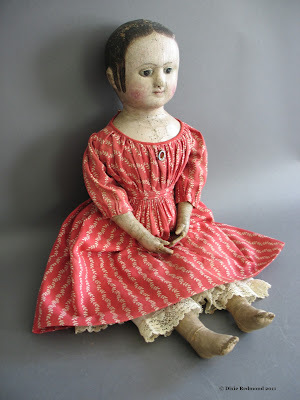 Antique Auction - One Day Only! "That will be $3.50," the clerk with the puffy white hair says. "Can you tell me where Old Washboard Road is?" I ask as I slide a $5 bill toward her. "Ayuh. It's across the road there," she moves her head up and to the right behind her while she makes change. Through the road salt glazed window you can see a road with a green street sign and an Auction Today sign below it. A red arrow points the direction down Old Washboard Road, which follows the Penobscot River. I find out quickly why the road is named Old Washboard Road. The frost heaves in the road on this spring day make you feel like you're driving over an old-fashioned washboard. A little further down the road is underwater at a low spot. All the spring rains and melting snow have overwhelmed the sides of the road for an 8 foot stretch. I take a deep breath, say a prayer and plow on through. Yes! Old Bessie is triumphant! The road bends around and an old 19th century house comes into view. It's the kind of house that brings to mind the rhyme, "Big house, little house, back house, barn." About 25 people are standing just outside the entrance of the old farmhouse barn. They are dressed in parkas and gum rubber boots, because it's still a bit cold in Maine in April but it's warm enough that it is Mud Season. Some of them have their hands in their pockets and others are holding styrofoam coffee cups. The old barn is stuffed with antique seaman's trunks and old baby carriages and tools and kitchenwares and rotting hay and rusty who knows whats. There are treadle sewing machines and old electrical Singer Featherweight machines and 50's toasters. In the rafters of the barn is the carcass of a very old airplane - and that's why most of these Mainers are here. The auctioneer wheedles the crowd - dispassionate except for a couple of hecklers - for one more bid on a shiny 1950's scooter. The item ends at around $35 and the next lot is brought to the auction block. This is a box lot - vintage tin coffee pot, some 50's kitchen utensils, a cutting board with an old cloth doll arm hanging over the edge from under the cutting board. I can see that this is a painted cloth arm, and it looks like it has a separately attached thumb. "Do I hear $5 for this box of treasures?" the auctioner asks. "Aw come on folks, this is the first auction of spring, let's show a little spring action here." He holds up an old fashioned egg beater and turns the handle so the gears spin beneath his folksy auctioneer's grin. "I'll give you a dollar for it, Harry, but you got to scramble me some eggs after the auction!" calls out a man in a bright red flannel shirt. Aah Your killin me!!! I havent had a tag sale fix in months!!! Dix - I´ll be in that room too - so watch out !! !